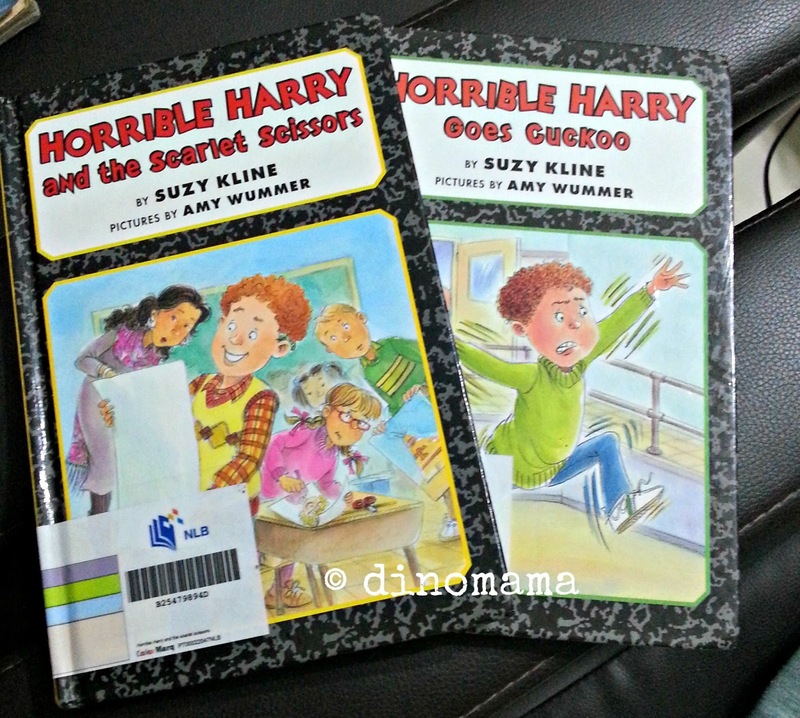 When DinoBoy choose these 2 books I frowned because part of the title says "Horrible Harry", I immediately thought its a book about a boy who is out to do horrible things to his classmates and family members. I suggested to DinoBoy to "put these books back because I think they are not a good book. ", of course he resisted and so these books went home with us. "Horrible Harry is a popular children's book series written by Suzy Kline which is used in American elementary schools for teaching reading. 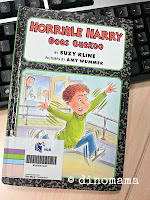 It is based on a 3rd grader named Harry, and his misadventures are told through the words of his best friend, Doug. Harry's and Doug's friends are Sidney, Song Lee, Mary, Ida, and Dexter. His teacher is named Ms. Mackle. His principal's name is Mr. Cardini. The first Horrible Harry book was published in 1988." * Click the wiki link to see the list of Horrible Harry books. A few days later I picked up one of the book to read and was surprised it was rather a good chapter book. If your child is progressing to from picture story books to chapter books, this is a good series to start with as it's engaging with simple words and easy to understand story line. By the way, there is nothing horrible that is happening in the story or anything horrible about Horrible Harry other then then usual tricks and mischievous act of a normal child. Let me share my review on one of the book. For the second week the children are unable to go outdoor during recess as it was icy and slippery, this makes Harry upset. It only makes it worst when his friend called him names that caused both of them to be punished. On top of that he was not happy to be last in the line for the class' VIP chair, then he forgot to bring his overdue library book to school which means he is unable to look for information about birds for the class' project. Despite all these unfortunate events, every thing turns out well with a surprise visit by a feathered friend and Harry even did a great report about a bird that not many people likes. 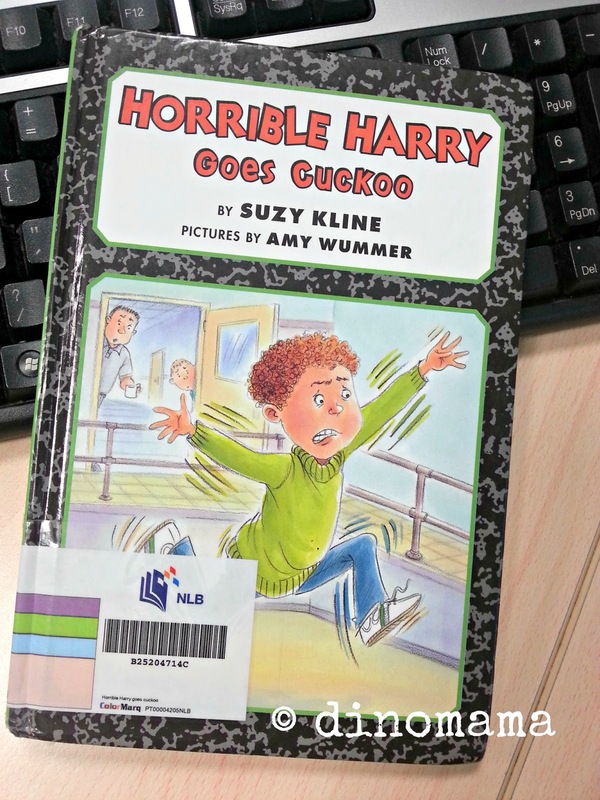 I like this book because I can relate to how Harry was feeling when he was being cooped up indoor unable to go out to play and his need to run in the gym as he is "going cuckoo" because that is exactly how DinoBoy will do if he is in the same situation. I only read these 2 titles but I am already thinking of borrowing the rest of the series for both myself and DinoBoy to read. DinoBoy is having some issues in school, he seems to be unable to accept other kids' ideas & suggestions easily, he is not being a very good team player in class and have difficulty accepting that every one are different. The characters in Horrible Harry stories has different personality, just like a normal school environment, this will teach DinoBoy to embrace and enjoy their differences instead of forcing them to adapt to him. I would love to know what character building books are you reading to/with your kids now.